The beautiful Goyt Valley lies in the Peak District National Park on the Cheshire/Derbyshire border close to the town Macclesfield. 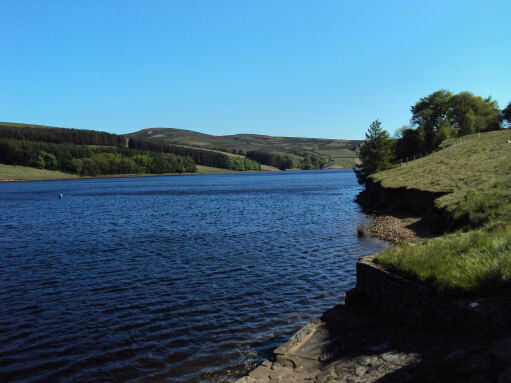 It contains some stunning scenery, including high moorland, gritstone edges and the highly attractive Fernileee and Errwood reservoirs. To the south lies Goyt’s Moss and to the north the village of Fernilee. The western side of the valley is flanked by Shining Tor, which rises to a height of 1,833’ and Cats Tor at 1,703’. Much of the land in the valley is readily open and accessible to walkers, with a network of paths and bridleways. Prior to the construction of the reservoirs the valley was home to a thriving community with farms, a paint works, a railway, a Victorian mansion, coal mines, a quarry, a school and even a gunpowder factory. 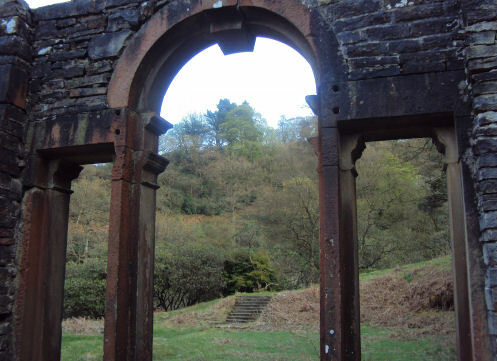 Glimpses of this past life remain in the valley including the romantic ruins of Errwood Hall, the paths that follow the route of the old Cromford and High Peak railway line and Goytsclough Quarry. Much of the moorland and the cloughs that cut across the valley, have been designated an SSSI. Birds found on the moors include birds of prey, golden plover, snipe, curlew, lapwing, skylark, meadow pipit, whinchat and ring ouzel. A small herd of red deer occupy the woodland around the reservoirs. The River Goyt rises on bleak Axe Edge Moor, near the famous Cat and Fiddle Inn (the second highest inn in England). It feeds into the Errwood and Fernilee Reservoirs. The Goyt itself eventually becomes a tributary of the River Mersey. Derbyshire Bridge at the head of the valley derives its name from the fact that it was once the boundary between the counties of Cheshire and Derbyshire. 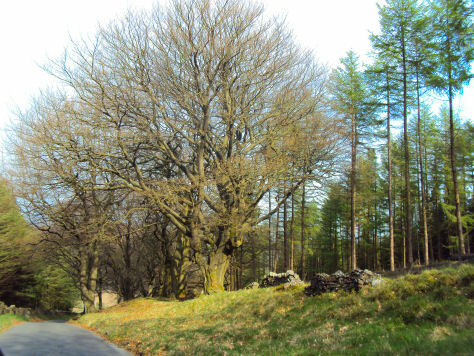 The area has a car park and picnic site and offers some stunning scenery and fine walks across the moors. 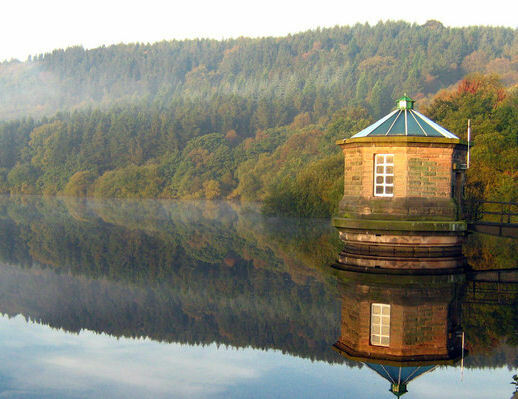 Fernilee Reservoir was the first of two reservoirs built in the Goyt Valley, Errwood Reservoir being the second, both were constructed by the Stockport Water Corporation and are currently owned by United Utilities. 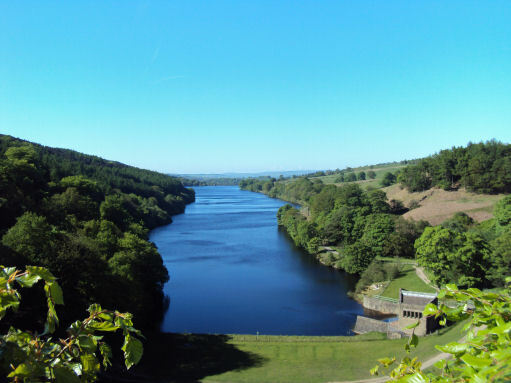 The reservoirs provide drinking water for the town of Stockport and its surrounding areas. Errwood Sailing Club uses Errwood Reservoir for sailing and racing. North West Water now own much of the Valley and surrounding moorland. From the Errwood reservoir dam the view of the valley, in either direction, with its two reservoirs is superb. The name Goyt is thought to derive from the word goit which means a channel for water or a stream from the old English word gote. 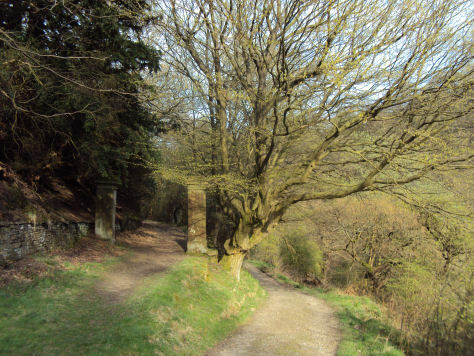 Local legend states that a highway man called Pym used to lay in wait to ambush those who used the packhorse route, at Pym Chair, on the moors to the west of the Goyt Valley, although it is also thought Pym was a preacher who gave sermons here. 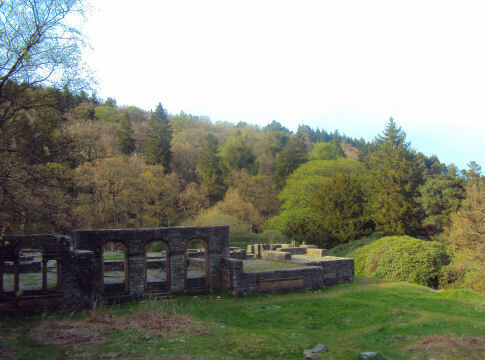 Ruined Errwood Hall, the scene of the climax of the fantasy novel The Moon of Gomrath by Alan Garner, is a popular tourist attraction in the Goyt Valley. The hall, once a mansion on the moors, was built in the 1830s by the wealthy Samuel Grimshawe, a Manchester businessman and was occupied by three generations of the Grimshawe family for the next hundred years. The hall was the centre of a thriving estate of over 2,000 acres (8.1 km2), consisting of several farms, a school, the Cat and Fiddle Inn on Axe Edge Moor, a private coal mine and the hamlet of Goyt's Bridge. The family planted many specimen trees including an abundance of azaleas and rhododendrons. Samuel Grimshawe 's grandchildren were the last members of the family to live at the hall, which was later demolished in connection with the construction of the Fernilee reservoir in 1934. Stones from the demolished hall were used to construct the water treatment works below the reservoir. Only the foundations a few sections of wall now survive but the arches of what was probably the drawing room remain. 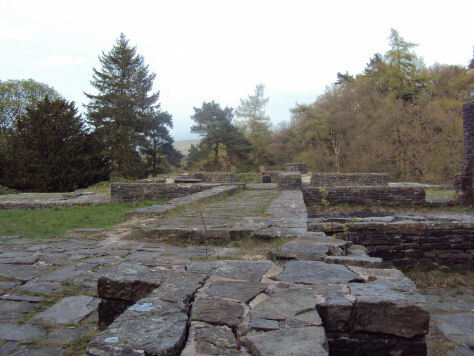 These remains are in the care of the Peak Park Authority. On a hilltop a few hundred metres to the west of the hall ruins is the family graveyard which restored by North West Water in the 1980s. 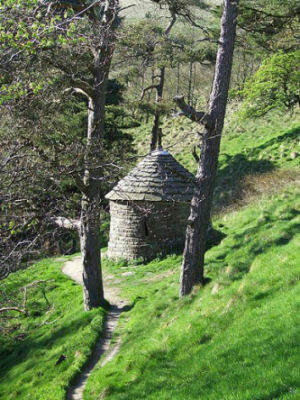 Situated to the north of the hall is a small stone shrine or chapel, erected by the Grimshawe family to the memory of Miss Dolores de Ybarguen, a Spanish aristocrat who was the teacher at the estate school and governess to the Grimshaw family and who died on a visit to Lourdes. The shrine is still regularly used for private acts of devotion, intercession and remembrance. The rhododendrons and azaleas planted by the Grimshawes have flourished and now have to be strictly managed. The best time to visit the hall is April-May when they provide a stunning sight in full bloom. *Commencing at the Errwood car park, exit the car park walking away from the reservoir and following the track uphill. Pass through the gap in the stone wall and continue to follow the track entering woodland. *After climbing the steps turn right almost heading back on yourself until until you loop around to the left, continue until the ruins become visible.